United Blood Services is a nonprofit community blood center headquartered in Scottsdale, Arizona. They provide blood and blood products to more than 500 hospitals in 18 states across the nation. According to their website, United Blood Services, "[exists] to make a difference in people's lives by bringing together the best people, inspiring individuals to donate blood, producing a safe and ample blood supply, advancing cutting-edge research and embracing continuous quality improvement." Unlike others in the industry, United Blood Services offers valuable incentives to its donors through a loyalty rewards program. Points earned from donations can be redeemed at the Hero Rewards Store. Redemption options include gift certificates to be used at your favorite retailers and restaurants, movie tickets and t-shirts. Donating blood through United Blood Services is a fairly simple and can be done three times per year. United Blood donation centers and drives can be located by zip code using the online tool found on the website. Once you've found a nearby location, create an online profile so you can make an appointment directly from the website. You can expedite the screening process by completing the Fast Track Health History Questionnaire online. Donations can take anywhere between 10 minutes and 2 hours, depending on the type of donation. These include whole blood, double red cell, pheresis, autologous and directed donations. You can learn more about the donation experience at their website. Special criteria apply for individuals between the ages of 16 and 22. Beyond giving blood, you can get involved with United Blood Services by organizing a blood drive. Is United Blood Services Legit? 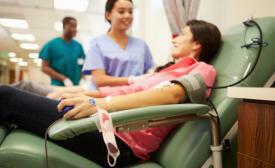 Yelp: A reviewer from Phoenix, Arizona described how the upbeat and positive attitudes demonstrated by the staff members eased her fears about donating blood. Facebook: Several reviewers from the New Mexico area cited well-trained and friendly staff as the highlight of their visits. Birds Eye: Reviewers from Ventura, California repeatedly referred to the cleanliness of the facility and the great first impressions left on them by staff members. On the other hand, there were others who weren't quite as impressed with United Blood Services. A complaint from a reviewer in Arizona on USA Complaints.com mentioned excessive wait times and rude staff. Another complaint from the BBB in Las Vegas, Nevada stemmed from issues with advertising and sales but was resolved in 2015. Ultimately, the choice is yours and you must be comfortable with the organization and location you'll be using before making a decision. Regardless of where you donate, you'll play an integral role in improving the health and possibly saving the lives of others in need of blood.